The 2009 Hermann Trophy semi-finalist and the NCAA Pac-10 Player of the Year in men’s soccer proved achievements are born from extraordinary circumstances. For Danny Mwanga of Oregon State University, his eventual escape from the Democratic Republic of the Congo (DRC) was only one of many goals he continues to achieve on and off the field. And his game is just beginning. There is a symmetry of movement and determination when Danny Mwanga steps onto a soccer field. His skills, intelligence and agility create a dynamic resource for his Oregon State University (OSU) team that have proved a viable challenge to their opponents. Recognition of his talents as a forward reach beyond OSU. He was named as one of 15 semi-finalists for the 2009 Missouri Athletic Club's Hermann Trophy, the top achievement for intercollegiate soccer in the U.S. Last month, Mwanga was awarded the 2009 Player of the Year for the Pac-10, the collegiate sports bracket for the National Collegiate Athletic Association (NCAA) on the West Coast. He was the Pac-10’s Freshman of the Year in 2008. Mwanga’s achievements on the field point toward a successful future in professional soccer, better known as football outside of the U.S. It is the top sport in the most industrialized countries and the poorest nations. Though Mwanga is setting the stage for his career in one of the richest, his game began as a young child in a country filled with political violence and economic strife. His journey from the Democratic Republic of the Congo (DRC) to the U.S. is an achievement in itself. Soccer played an important role along each step of his journey. Mwanga’s early years were idyllic for a young boy living in the DRC’s capital. His mother, Leontine, and his sisters doted on the only boy in the family. His father, Belmonde, worked as an advisor with the government. Born in 1991 with the given name Jean Marie, a popular French name for boys, Mwanga spent his days in school and on the soccer field. His family had created a protective life for him and his sisters, which was far from the reality inside the country. Marshall Mobutu Sese Seko ruled the DRC as a hard-line dictator from the mid 1060s. In 1971, Mobutu changed the country’s name to Zaire. “He was a dictator and people didn’t like him,” Mwanga said. “Even people walking around him couldn’t do what they wanted.” Mwanga learned years later how anyone questioning Mobutu’s rule was jailed or killed. While the after-effects of the Rwandan genocide spilled across the border along the eastern regions of the DRC, the political violence of rebel troops created a civil war in the west. Kabila was supported by armed groups from Rwanda and Uganda. When he failed to pay his troops, he told them to get their rewards from the country. It was a dangerous mix with the country’s civilians paying the greatest price. Mwanga’s mother tried to maintain a normal life for her children. “She was trying to hide it from me,” Mwanga said. “I couldn’t understand my sisters reactions when they would ask her what was wrong. My mother said he would come home.” Leontine’s struggle to protect her family became overwhelming. There was talk of a greater war in the DRC. Then the talk got personal. Leontine began to hear of threats against her life and was faced with the most difficult dilemma of her life. She could try to escape and build a life for her family outside the DRC or try to survive inside the country. “We knew she had to leave because there were people coming up and telling her of the rumors.” The Mwanga’s knew of other families killed because of their ties to the former government. Soccer became the main focus of Mwanga’s life beyond the street matches. Mwanga’s uncle was a soccer coach, so he taught his nephew the fine points of the game. “My uncle, he’s still in Congo, was a coach for a first division team. He’s the one who after my mom left took care of me.” Mwanga followed his uncle to team practices everyday. “At first I had to go and just sit and watch those guys play because I was really young,” said Mwanga. “Those guys were six or seven years older than me.” Mwanga’s interest grew each day, until he finally convinced his uncle to let him train with the team. “The more I trained with them, the better I got,” he said. “I started to improve.” Mwanga said he was getting noticed by many on and off the team for his skills. When Mwanga and his sisters arrived in Portland, he found himself in a culture very different from his own. “I personally felt like I had to start everything over,” he said. “The biggest challenge was that I couldn’t express myself.” Mwanga described his frustration and isolation inside a country where he could not speak the language. Without knowing English, Mwanga and his sisters stayed home. Their mother had to work to support her family, so the children stayed at home during their summer in the U.S.
Everything had changed for Mwanga except for one thing. “I knew everything was different here, but I knew soccer doesn’t change. It’s amazing how it’s the same thing. It doesn’t change no matter where you are.” So without any English skills or knowledge of the area, Mwanga could still pick up his soccer ball and kick it around. He found a local park to practice by himself. One day he spotted a group players and joined in their game. He discovered they were from Ethiopia, but couldn’t talk to them. Without any proof of his academic credentials, the need to learn English and still under 18 years of age, Mwanga enrolled at Jefferson High School in the fall. He began English as a Second Language (ESL) classes and other courses to learn about American culture. He would see again meet with the Ethiopian students he met in the park during the summer. Mwanga remembers when the group of Ethiopian students saw him at Jefferson. “They were so happy I was finally here at school,” said Mwanga. “They said, now you get to play.” They told the school’s soccer coach about Mwanga. He didn’t have any trouble making the team. Mwanga attended Jefferson High School for two years. 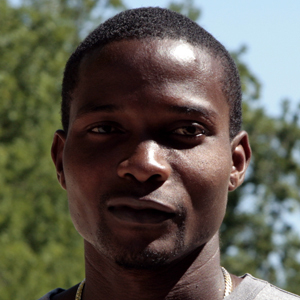 During that time, Mwanga studied English and proved himself a champion on the soccer field. He made second team on the 5A Boys’ All-State team in 2007. By 2008, he was considered one of the best recruits for college soccer after completing his program at Jefferson. After high school, Mwanga wasted no time landing spots on amateur teams. He first played for the Westside Metros International. A Congolese man who knew Mwanga’s sister saw Mwanga play and thought he would be perfect for the Portland Timbers. He introduced Mwanga to Cony Konstin, the Timbers’ assistant coach. Konstin had seen Mwanga play on the men’s team in Portland and noticed his talent. But, he gave Mwanga some important advice. He told him he would benefit more by first going to college and playing soccer on a collegiate team. Mwanga realized the advantage of attending college and honing his soccer skills, but faced an ongoing obstacle with his missing transcripts. He was considered ineligible to play in NCAA competition without verification of his school records from the DRC. In 2008, assistant coach Paul Meehan contacted the U.S. Department of State and Congolese Embassy in Washington, D.C. to track down Mwanga’s records. By that fall, Mwanga had his records and OSU had one of their best players in years. Mwanga’s skill earned him back-to-back Pac-10 Player of the Week awards this season. After being named the Pac-10’s Player of the Year this month for leading the conference with 14 goal scores this season, Mwanga is gaining nationwide attention. He is one of 34 finalists for Soccer News Net’s 2009 Player of the Year. Mwanga’s other plan centers on the health system in the DRC. “A lot of people die from small diseases that here in the U.S. they would be treated for two days and get well.” Mwanga sees both his plans as strengthening the people back home with education, training and medical service for jobs. “That will help people from starving and things like that,” he said. With family and friends remaining in the DRC, Mwanga thinks often of them and what they endure. He connects with them through email and phone calls when he is able and when the technology is working. His uncle continues to give him tips. But he worries about them. Mwanga said that the political situation in the country is still uncertain, but he is hopeful. Mwanga has already discovered that his talents symbolize a unique sense of leadership for his family, fellow Congolese and other refugees throughout the Portland region. During this summer, he played for the Real Salt Lake U-18 club, which saw some international matches in Europe. He also joined with many international players at the local level to share and inspire others. Along the sidelines of one of the organized soccer tournaments in Portland, players from over a dozen African countries and other nations around the world whispered Mwanga’s name in awe and respect. He invokes both admiration and a challenge to his fellow players. Vincent Chiriwami of the Congolese Community of Oregon remembers Mwanga when they met three years ago. “I didn’t know he was a super player until I watched him play,” said Chiriwami. “He helped us win the All-Nations Championship this August.” Mwanga was captain of the Congolese soccer team that won the championship this year. Chiriwami said the win over six teams, “was because of the tremendous skills of Danny.” The organization features Mwanga’s photo with the team on their website. Chiriwami said the soccer games bring back the best of their culture and America. During the annual Liberian Independence Day celebration at Clinton Park, players representing the DRC, Liberia, Ghana, Senegal and other nations battled it out on the field. Along the sidelines, the numerous “coaches” shouted out their advice while families gathered around barbeques and coolers. But Mwanga was always the centerpiece of attention. Vote for Mwanga links: Mwanga is one of 34 nationwide finalists Online voting counts for 40 percent, 60 percent cast by editorial staffs of the six websites. Voting ends on December 19, 2009.